This characteristic 17th century stone-built house has been divided into 6 apartments (among which IUP579 and IUP581) and annex (IUP772) at approx. 80 m. Situated inside a property of 150 ha on the side of a hill (480 m a.s.l), it is surrounded by stunning meadows and woodland and breath taking views over the valley. 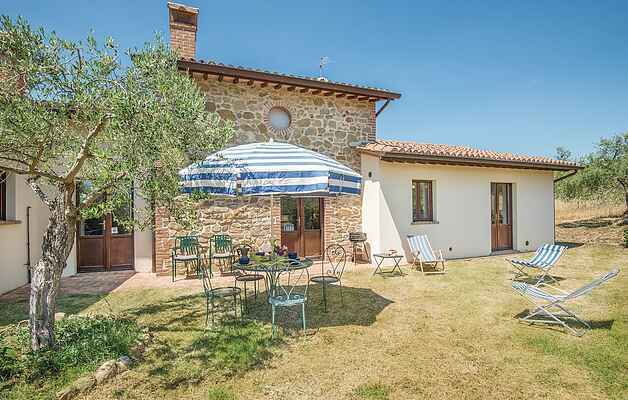 The house is surrounded by beauty and is the perfect place forsoaking up the sun amongst the olive trees. Access to the house is by 1 km of dirt track road.The accomodation has a beuatul, modern, spacious feel to it and offers 2 bedrooms but can sleep up to 8 guests as there is a sofa be din the living room and dining room. The property also nboasts a very inviting swimming pool and gazebo that you can enjoy on those hot sunny days, and you can also take advantage of the built-in barbecue and dine alfresco on those beautiful summer evenings. The décor is tasteful, light and airy and has a home from home feel. The accommodation also benefits from Internet access in the common room. A baby-bed is available upon request. Also, be sure to sample or purchase the local olive oil!